RISCARIO INSIDER: Warren Buffett's Tough Career Choice: Actuary or Billionaire? 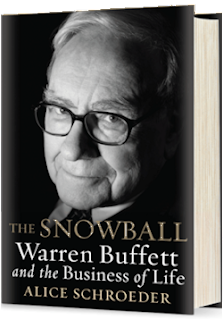 We're currently listening to The Snowball: Warren Buffett and the Business of Life. We didn't know much about Warren's background. Alice Schroeder weaves an intricate, intriguing portrait. Melt the snowball and you'll find the mind of an actuary wrapped in lots of money. Here's an excerpt from Chapter 15: Strike One, page 137. While a student at Columbia in 1951, Warren learned about insurance during an unannounced Saturday visit to GEICO headquarters in Washington, DC where he managed to meet a vice-president. Warren had even considered actuarial science --- the mathematics of insurance --- as a career. He could have spent decades toiling over tables of mortality statistics, handicapping people's life expectancies. Besides the obvious ways this suited his personality --- which tended toward specialization, collecting, and manipulating numbers; and preferred solitude --- working as a life actuary would have let him spend his time pondering one of his two favourite preoccupations: life expectancy. However, his other favorite, collecting money, had won out. Longevity is often the larger concern. Since we're living longer, we need more money to maintain our lifestyles and to prepare for the extra financial costs of poor health. In turn, accumulating more money means working longer or making riskier investments in hopes of getting higher returns. Neither is appealing. Warren needn't worry about the financial consequences of life expectancy. While you may think insurance is boring, Warren saw opportunity. He also learned that insurance companies take their customer's premiums and invest them long before claims are paid. That sounded like getting to use somebody else's money for free, just the kind of idea that appealed to him. If you feel that insurance companies mint money, consider getting shares. The investment earnings get reflected in the insurance premiums. GEICO sold automobile insurance via direct marketing to preferred risks (mainly government employees). This resulted in a winning combination: lower expenses and lower claims. GEICO seemed to Warren a no-lose proposition. That Monday, less than 48 hours after he arrived back in New York, Warren dumped stocks worth three-quarters of his growing portfolio and used the csh to buy 350 shares of GEICO. It was an extraordinary move for the normally cautious young man. There are sure to be other insights in The Snowball. The book runs 838 pages (960 including the notes and index). While Warren Buffett could have become an actuary, he instead ended up as billionaire. Such is life. 10-8 Leveraging: Are Tax Audits on the Way?